This view of Curiosity's deck shows a plaque bearing several signatures of US officials, including that of President Obama and Vice President Biden. The image was taken by the rover's Mars Hand Lens Imager (MAHLI) during the rover's 44th Martian day, or sol, on Sept. 19, 2012. If President Barack Obama wants to win over the space geeks watching tonight's (Oct. 3) debate, he might consider mentioning that he's the only candidate who's made his mark on Mars ... literally. Obama will square off against Republican challenger Mitt Romney tonight in Denver for the 2012 presidential election's first debate, which covers domestic policy. The two contenders' visions for the nation's space program may well come up, at which point Obama could mention that his autograph has been cruising around Mars for nearly two months. 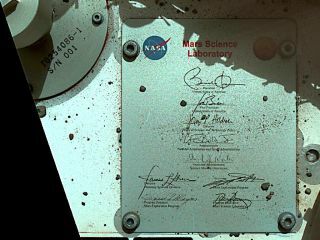 The president's signature is etched on a plaque that technicians affixed to the deck of NASA's Curiosity rover before it launched from Florida's Cape Canaveral Air Force Station on Nov. 26, 2011. The $2.5 billion robot landed inside Mars' huge Gale Crater on the night of Aug. 5, embarking on a two-year mission to determine if the Red Planet has ever been capable of supporting microbial life. Obama's autograph isn't the only one on the plaque. Also signing were Vice President Joe Biden, White House science adviser John Holdren and NASA head Charlie Bolden. Ed Weiler, who was NASA's science chief when the plaque was created, also contributed his John Hancock. So did a number of heavyweights in NASA's Mars program, including program director Doug McCuistion, lead scientist Michael Meyer and Dave Lavery, the program executive for Curiosity's mission. Curiosity isn't the first craft to carry a presidential signature to another world. Richard Nixon's autograph rode to the moon aboard NASA's Apollo spacecraft in the late 1960s and early 1970s. Curiosity also bears the signature of Kansas schoolgirl Clara Ma, who gave the 1-ton rover its name. Ma submitted the moniker "Curiosity" during a NASA contest as a sixth-grader, and the name rose to the top in 2009. That June, Ma traveled to NASA's Jet Propulsion Laboratory in Pasadena, Calif., which manages Curiosity's mission. Wearing a contamination-reducing "bunny suit," she entered a clean room and signed a panel that was later attached to Curiosity's base. The six-wheeled robot is also carting around the names of 1.24 million people who submitted their monikers to NASA. The names are etched — in very small print — on two dime-size silicon chips affixed to Curiosity's deck.